If you’re a creative kind of person and would like to sell your creations online, very likely the first question you’ll ask is: How do I do it? The problem for many creative types is that they don’t have the time, technical skills or inclination to build themselves a website of any kind – let alone an eCommerce website, which is a notoriously complicated process. They could pay someone to create and maintain a website for them, but that can be expensive. Or they could sign up with a marketplace like Amazon, and end up having to hand over at least 30% of the sales proceeds. All the creator really wants to do is give people a simple “Buy this” link where they can hand over the readies and download the creation. Simple and straightforward for all concerned. Fortunately, a third option has arisen in recent years that allows creators of digital products to do exactly that. The providers of this third option are known as digital goods services, and they’re the subject of Kay McMahon’s report, Selling Digital Products the Simple Way . We’re putting our business eBooks on a special free promotion for two days only. The sale starts at 0800 GMT on Friday 27 December (nominally – depending on Amazon’s internal workings, the actual start may be anything up to two hours after that time) and ends 48 hours later, ie 0800 GMT on Sunday 29 December or up to two hours afterwards. Get them while they’re free! As always, if you read the books and like them, please give them a review on Amazon – good reviews help us drive sales. Thanks! Download Snake Oil! free of charge! Offer lasts from 0700 GMT on 27 July to 0700 GMT on 28 July. If you’d leave us a review as well, we’d appreciate it. Thanks! Are YOU Sick Of Being A Wage Slave… While Your Fat Cat Bosses Take It Easy? Don’t YOU Deserve A Better Life? You Can Make $$$,000s WHILE YOU SLEEP!!! If you’ve ever considered trying to make a bit of extra money online, then you’ve probably already encountered the sort of messages above while you’ve been pondering how to do it. 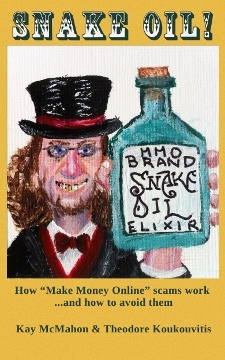 A whole industry has sprung up offering this kind of “Make Money Online” (MMO) proposition. A quick search of the Web will turn up thousands of different websites, all promising to show you how you can make incredible amounts of money online, with very little required from you – little or no expertise, little or no effort, and just a few dollars to unlock the door to limitless wealth. Everyone’s supposed to have a book in them, aren’t they? That piece of folk wisdom underlies the dream that many people have of making a living online through writing. 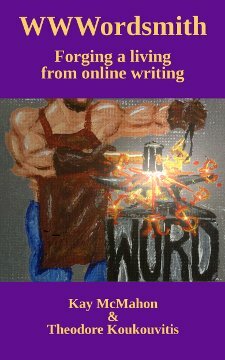 WWWordsmith: Forging a living from online writing is here to explain how, if they’re good enough, they can make that dream a reality. 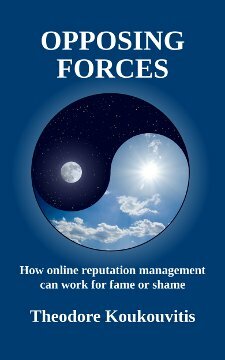 Authors Kay McMahon and Theodore Koukouvitis have teamed up again to write about the ins and outs of making money online from writing. Each of them brings their own particular perspective to bear on the online writing industry. In building his career as a successful freelance writer, Koukouvitis has run the full gamut of job-seeking platforms and has amassed rich experience of the methods required to compete successfully for commissions in a fiercely competitive marketplace. McMahon has been running a business based on websites – for which she’s supplied much of the writing – for well over a decade. The result is a book that covers all aspects of earning a living online through writing. First, a brief introduction looks at the practical benefits of an online writing career, and sets the scene for the discussion of the two basic ways of making a living online through writing: writing as a job (freelancing), and writing as a business (self-publishing). There follows a look at what makes people willing to pay for writing – the needs that the writer must satisfy in order to succeed. Do you care what other people think about you? For most of us, the answer is that we care at least about what some people think about us, some of the time – whether we’re applying for a job, asking someone out on a date or even just choosing what clothes to wear for a special occasion. For a business, the answer has to be a resounding “yes” – your business flourishes or perishes on the basis of its reputation. So if what other people think about you is important, what about the things that people are saying about you? Facts Lab Book of Greece – Relaunch promo!